Read our helpful guide to second hand Honda Civic. Why buy a used Civic? Which used Civic should I buy? AA Cars works closely with thousands of UK used car dealers to bring you one of the largest selections of Honda Civic cars on the market. You can also browse Honda dealers to find a second hand car close to you today. 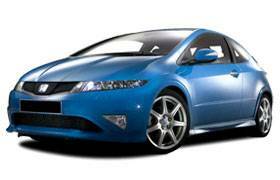 All used Honda Civic on the AA Cars website come with free 12 months breakdown cover. The Civic has been a familiar part of UK forecourts for the best part of four decades. Modern buyers will focus largely on generations seven (01-05) and eight (06-11) and find a hatchback that's aimed at those who are a little more style conscious but are also concerned with excellent build quality. Internally, the modern edge continues, the dash mixes analogue and digital display on a futuristic electric blue canvas. In terms of specs, the recent models have gone upmarket with air bags, chilled glove box and panoramic sun roof on offer. Three and five door Civics also offer impressive loadbays. The Civic is a driver's car, light and responsive as standard, but those looking for even more driveability should consider the Type-R. The Type-R enjoys a 2.0 i-VTEC engine delivering 210 bhp and 0-60 in 6.5 seconds. The cost-conscious and eco might want to consider the ICTDi diesel engine which offers excellent fuel economy. Having been around for over four decades, the Honda Civic is a mainstay of the compact and subcompact market, still going from strength to strength. While it may not have in the past boasted sales numbers to match its rivals (such as the Ford Focus and VW Golf), the Honda Civic is now thought of as one of the most reliable and affordable cars on the market. Largely down to a constant reputation of reliability and good scores among customer satisfaction surveys, the Honda Civic continues to evolve as a car and gain popularity with buyers. A marker for well-built, reliable cars (in 2011 the manufacturers were named the Which Car? most reliable car brand), the Honda name is one well worth looking out for when shopping for a used car. With the Honda Civic the reliability is coupled with a car made to run smoothly and efficiently, and so is a good all-rounder in the compact and subcompact market. A stand out feature is undoubtedly the Civic's eye catching design, which is not only sleek and modern, but also a trendsetter in the market - a number or cars in the same class have followed on where the Civic started, using a similar curved bonnet and split rear window. The most recent models, while not being radically redesigned in terms of looks, have been designed with aerodynamics and efficiency in mind. Inside, the design of the most recent models has found critics finding fault with a jumbled dashboard and limited head room, but the Civic's boot and leg space is generally thought to be adequate, if not excellent. This makes it an ideal choice for families and those looking to fit in five people and still have ample storage room. 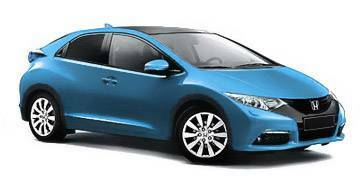 Civics are some of the most fuel efficient on the market, generally offering miles per gallon returns in the mid 40s for petrol engines. The universally lauded 1.6 diesel however, is noted for its efficiency, offering 75mpg and CO2 emissions of 94g/km, which means that it is road tax exempt. The 1.6 diesel has also been praised for its drive, which is widely thought to offer something a bit more lively than the rest of the range. Overall however, Civics are comfortable and reliable, if not always thrilling. The 1.4 petrol engine is thought to be the best entry-level car of the bunch, offering good all round specifications, including the six-speed manual gearbox that comes as standard on the full range. Honda Civics have been awarded the maximum five stars from Euro NCAP, and all come with ESP and anti-lock brakes with electronic brake force distribution. The EX GT trim however, features a Collision Mitigation Brake System, an automatic braking system which uses radar to detect imminent collisions. Having been around for over 40 years, Honda Civics have remained one of the most reliable and visually exciting cars on the market. Here's a brief history of the Honda Civic, stretching right back to the first one, launched in 1972. The first Honda Civic was launched in 1972 , first as a two-door model, but coupé, three and five-door hatchback models were subsequently produced. The high prices of fuel at the time and the fact that the Civic engine could run on both leaded and unleaded petrol made the car popular among buyers looking for fuel efficient cars. The second generation Civic was launched in 1980 offering a redesigned shape, and a more powerful, CVCC designed engine. 1983 saw the third generation Civic released, featuring a four cylinder D series engine. In 1988 the fourth generation model was launched having grown bigger and more powerful. This Civic proves to be considerably more popular in the mainstream market than previous models. The fifth generation Civic was introduced in 1992, boasting yet again more power. A sixth generation was launched in 1996 and was the top selling small car in the US in 1999 and 2000. 2001 saw the arrival of a seventh generation Civic. The end of 2001 saw the introduction of the Civic Hybrid, the first car to be certified as an Advanced Technology Partial Zero Emissions Vehicle by California's Air Resources Board. In 2006 the eighth generation of Civic was launched, this time with a radical exterior redesign. SD navigation system with integrated Bluetooth Hands Free Telephone, 6-speed manual transmission, 5-speed automatic transmission, leather multi-functioning steering wheel, drilled aluminium foot pedals, dual climate control, front fog lights, rear view parking camera, electrically retractable door mirrors, remote retractable door mirrors, remote power windows, dusk-sensing auto lights, rain-sensing auto wipers, cruise control with speed limiter, Bluetooth Hands Free Telephone system. 6-speed manual transmission, 5-speed automatic transmission, heated front seats, premium audio set up - subwoofer with MP3 capabilities, video jack/USB connection, HDD navigation. 6-speed manual transmission, 5-speed automatic transmission, 17" alloy wheels, Smart Entry and Start, high beam support system (HSS), Bi-HID headlights, headlight washers, privacy glass, panoramic glass roof, auto dimming rear view mirror, HDD navigation system. What should I look for when buying a used Civic? Keep an eye out for a few of these features to make sure you get the best possible car for your money. Check the exterior for any noticeable rust or slack repair work. Keep an eye out for any leaks or noticeable errors. Its also worth gently pushing down on the bumper to check the struts - the more it bounces the worse condition the struts are in. Check under the bonnet. Particularly at the base of the timing belt cover for any leakage (which would indicate a leaking water pump), and under the engine, where the transmission meets the block (which would mean a faulty main seal). Once inside, check the electrics and dashboard warning lights - the headlight, the air conditioning and any radio and electric windows. A problem on any of these features, despite how minor, could be a sign of something more major. Some previous owners have mentioned a problem with driver's door handles, so double check this to make sure it is working properly and doesn't stick. Older generation Civics may suffer from frazzled front tyres, so make sure you get an up close look. Newer models, with ESP and traction control, tend not to suffer from this. Civics, as are all Hondas, are very well-put together, reliable cars, and so if there is a problem it would likely to be a major, obvious one. With just a bit of common sense you'll be able to find a quality car that will serve you for many years to come.